Eastern’s Caterina Miecchi (18) attempts a spike during the Lady Eagles victory over Ironton St. Joe on Thusday in Tuppers Plains, Ohio. TUPPERS PLAINS, Ohio — The Lady Eagles keep flying. 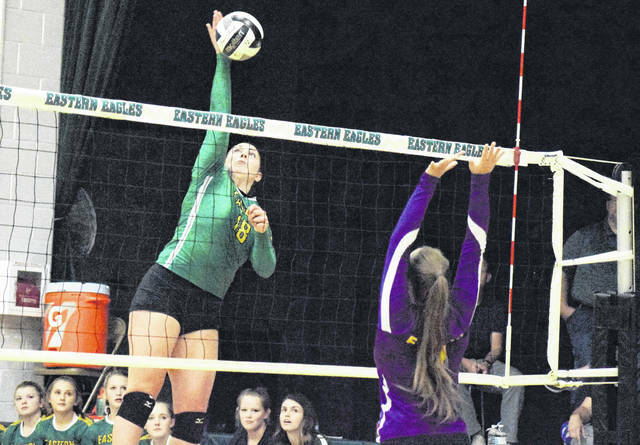 The Eastern volleyball earned their 21st sectional championship in the program’s history, as they defeated visiting Ironton St. Joseph three games to none on Thursday night in a Southeast District Division IV tournament match in Meigs County. Following a 1-all tie in the opening set, the Lady Eagles (18-5) soared to a 17-4 lead en route to a 25-11 victory. In the second set, EHS never trailed as they jumped to a 12-1 advantage before outscoring 13-5 the guests the rest of the way to take a 25-6 win. The finale was tightly contested early, as the two squads played to five ties before the Lady Flyers took a 12-10 lead. 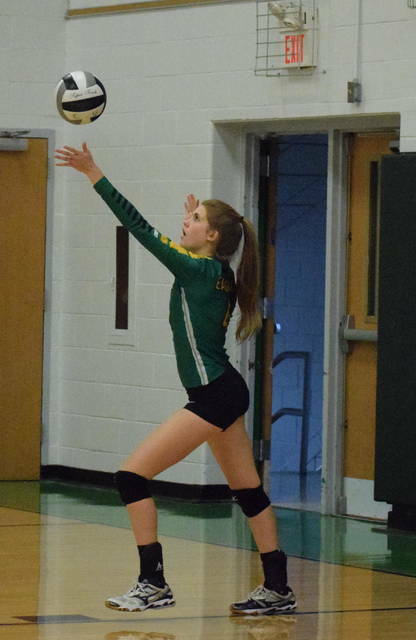 The Green and Gold, however, rallied to tie the contest at 12-all before utilizing a 13-4 scoring run to earn a 25-16 win and 3-0 match victory. Jenna Chadwell led the Lady Eagles service attack with 17 points, including five aces, while Alexus Metheny was next with 13 points, including three aces. Haley Burton posted seven service points, including one ace, as Caterina Miecchi followed with five points, including one ace. Kelsey Casto and Allison Barber concluded the EHS service attack with four points each, including one ace apiece, respectively. EHS finished with 46 digs, as Ally Barber led the way with 11, while Casto and Sydney Sanders followed with 10 digs apiece, respectively. Miecchi provided 12 of Eastern’s 31 kills in the contest. The ISJ service attack was paced by Grace Miller with four points, while Kaitlyn Sheridan and Kelsey Malone finished with three points apiece, respectively. Malone also had one service ace in the setback. Alex Holtzapfel closed out the Lady Flyer service attack with two points. Following the win, Eastern head coach Mykala Sheppard talked about what the win meant to her team. “This means so much to this group of girls,” Sheppard said. “They’ve worked very hard to get to where they played to this level tonight. Performing like they did in this match was really important to them. They stayed motivated and excited the entire game and worked great together as a unit. Those are all things we’ve been trying to do all season and it seems we’ve figured it out at the right time for the postseason. With the triumph, the Lady Eagles earn their first sectional championship since 2016 and sixth such title of the decade. Eastern returns to action on Wednesday, as they travel to Jackson for a district semifinal contest against third-seeded Pike-Eastern.